If you’re not the desk-job type, try using these small plastic storage drawers to store craft supplies, sewing essentials or your artistic muse. It’s Friday morning, and instead of eating at the kitchen table you’re working from it. 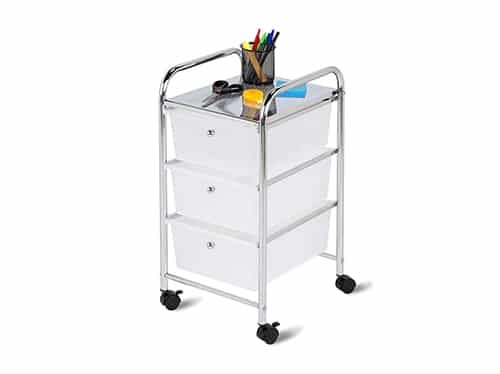 All you need is your laptop, your coffee, and this 3 Drawer Plastic Cart on Wheels to make WFH day your most productive day of the week. When it comes to home office storage ideas, you know this personal caddy has more gusto than Jim on presentation day. Unlike cheap plastic drawer units, the rolling bin is sturdy enough to hold 11 pounds on its top plate and slick enough to wheel around your house without scuffing the floors.